It has come to our attention that TM has reverted the monthly fee for its UniFi Advance from its promo price of RM 179 back to the original RM 199. This came almost six months after the plan was officially introduced to consumers. *The original promo price for 30Mbps with HyppTV Ruby Pack in October 2015. Its original standard monthly fee was RM 209 in August 2015. Apart from change in the monthly fee, UniFi Advance Plan now comes with free Voice Plan which was previously an add-on that costs RM 20 per month. Under this plan, customers receive free 600-minutes’ worth of voice calls to any mobile and fixed lines nationwide. Once that quota has been reached, they will be charged 10 sen per minute although calls made to TM fixed lines continue to be free of charge. Not to forget, there are also free 12-months free subscription to iflix and free 3-months premium access to Viu alongside faster upload speed that was implemented earlier this year. 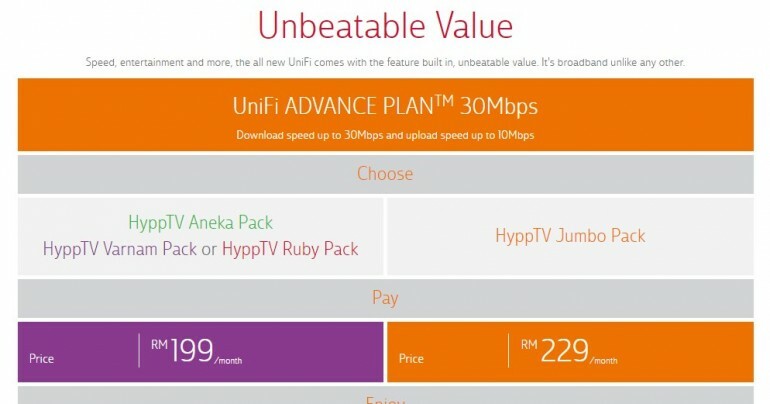 Meanwhile, the newly launched UniFi Pro Plan 100Mbps still can be obtained under its promo price of RM 299 per month.